The kids loved searching for treasure via maps with rhyming riddle clues, and the games were a hit too. The food? Not so much. My creativity had produced dishes like "parrot bones" (marinated chicken wings) and "sea monster eyeballs" (green jelly in half oranges with jaffa pupils). One little fellow looked sideways at me and whispered to my son, "How did she kill the parrots?" There was lots of food left over! Needless to say, being a kid at heart, I still love Talk Like a Pirate Day. It's held every year on September 19, and even has its own website. I think it's a great excuse to read books about pirates, play some pirate games and find lots of ways to express our inner pirates. Tune: "A Sailor went to Sea, Sea, Sea"
A pirate went to sea, sea, sea. To see what he could see, see, see. But all that he could see, see, see. Have your kids write some sentences or messages in this Pirate-to-English translator. Use it to inspire your menu for tonight's dinner. Go to Kerpoof Storybook, choose the pirates theme and create your own pirate story. Try using some characters, settings, problems and props from my lists below to create your own oral or written stories, and make up some new ones too. problems: no cannonballs, a fight, a hole in the bottom of the ship, stolen treasure, late for a pirate wedding, the British are coming! Zoe of Playing by the Book has good things to say about Pirate House Swap and Night Pirates, and suggests some great activities too. Be sure to check out the transformation of her daughter's bedroom into a pirate ship! Rebecca of Soup Blog recommends Pirate Peter and the Pig. Some Captain Pugwash episodes on Youtube, or if your kids are old enough, Pirates of the Caribbean. Despite my admiration for Johnny Depp, I prefer Pugwash! Muppet Treasure Island if you can find it. Here's a taste of it, starring Tim Curry, one of my very favourite villains. Your own treasure hunt board game. The background could be a map, and the different ship counters need to travel along various routes to get to the treasure. Invent chance cards that players must pick up at certain points, with good and bad fates eg "You helped a wounded seabird; go forward two spaces." or "Fired on by The French; make repairs and lose two turns." A catapult. Okay, I don't think pirates had catapults, but what young pirate could resist knocking a few lego people over with this nifty one? Your own pirate treasure map - use an online art editor like Artpad or Odosketch. Or paint, paper and ink. Here's some directions from DLTK and similar ones from BBC. A pirate costume for your teddy. Use this page as inspiration. A bookmark with a pirate theme. 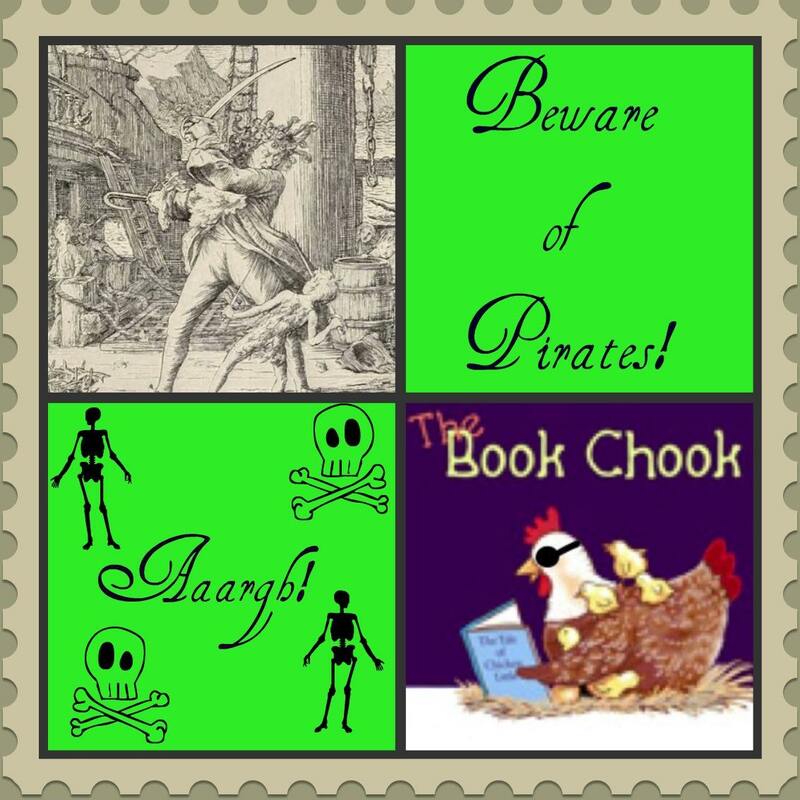 I used some free pirate clipart from Picnik for my bookmark, below, and for my treasure map above. Dig for Treasure game from Primary Games Arena. 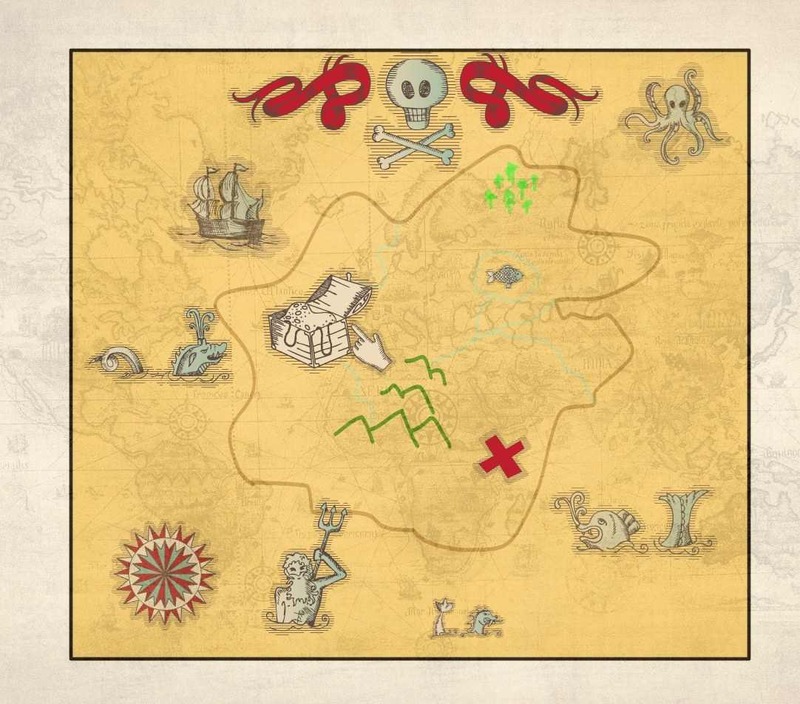 Follow map co-ordinates and clues to find treasure, using keyboard controls. The Talk like a Pirate Day website has lots of party ideas. Fill black water balloons with water and have a cannonball fight. Decorate with skull and crossbones flags, and play Pin the Patch on the Pirate. If you need clipart, I recommend Phillip Martin's pirate, or KidsTurnCentral clipart. Find some empty cartons and let your kids design their own pirate boats. Dress up with material scraps, cardboard, elastic, use makeup for scars and fake beards. If your kids are older, you might like to set the tone with an Abandon Hope All Ye Who Enter Here banner. My advice though - if you're going to have a Pirate Party, avoid heaps of leftovers and tone down your creativity in naming food! Unlike the neglected Parrot Bones, my cake WAS a success: I cut a slab into a free-form island shape, iced it and decorated it with plastic palm trees, toy pirates etc and made some jelly for the sea surrounding it. Simple. ***Be sure to read comments below where Tif adds yummy-sounding food ideas. You might enjoy my earlier post Party Like a Pirate. Find other reasons to celebrate in my right sidebar under the Celebrating label.